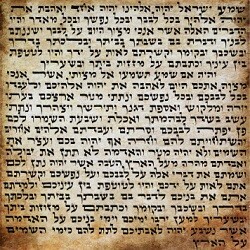 Unique Self is an original enlightenment teaching with antecedents in both Western and Eastern enlightenment traditions, and especially the Kabbalah lineage. It was developed principally by Dr. Marc Gafni between 1989 and 2012 in dialogue with numerous partners who have contributed to its unfolding. 1989 — Marc Gafni first taught “soul prints” at the age of 26 in a dharma talk at Delray Beach, Florida. The talk, delivered to five hundred senior citizens, communicated the Hebrew mystical intuition that our lives are infinitely and uniquely significant. He said for the first time, “Not only do you have a fingerprint, you have a soul print.” In the soul prints book, Gafni explicitly coins the term Unique Self and already, in a number of passages, talks about Soul Print not as a typology of ego, but as an expression of enlightened essence. 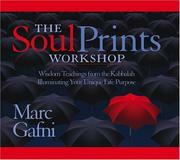 1990s — Marc Gafni developed the intellectual framework of the “soul print” idea from research and teaching related to what he termed Nondual Humanism and the Unique Self in the thought of Mordechai Yosef Lainer of Izbica and in the Talmudic and Kabbalistic tradition from which he emerged. 2001 — Marc Gafni’s book Soul Prints: Your Path to Fulfillment (Simon and Schuster) is published, becoming an international bestseller. 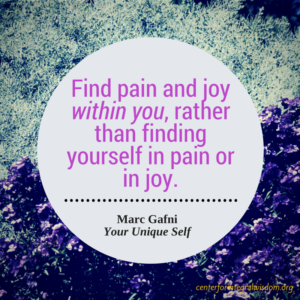 Marc wrote about Unique Self in a number of contexts, including the point in soul prints: “The address of the divine commands us each to realize our Unique Self.” In this context, he referred to the internal divine voice that lives in and as the interior face of consciousness. The book would later become the subject of a PBS special presentation. The book’s scholars’ page located a core source of the teaching in the teachings of Mordechai Lainer of Izbica. 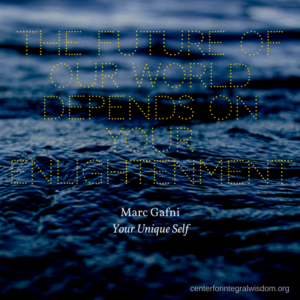 Early 2000s — Marc Gafni expanded his Unique Self idea by writing the first draft of his doctoral dissertation at Oxford University under the co-supervision of Professor Moshe Idel and Dr. Norman Solomon. Gafni showed that for Lainer, an essential part of the process of what he termed berur might well be understood as a clarification of Uniqueness beyond the egoic separate self, that is to day, individuation beyond ego. It was in this work that Gafni clarified his own understanding of this process of berur as being about the realization of Self beyond ego or individuation beyond ego. 2005 —Marc Gafni formulated the core understanding of Soul Print/Unique Self as perspective, as emergent from Hebrew mystical sources on the ontology of perspectives. In this understanding emerging from Hebrew mysticism and from deep conversations with Ken Wilber, including his radical emphasis on perspective, Soul Print/Unique Self was understood as the perspective attained at the post-egoic enlightenment level of consciousness. Gafni understood perspective to be a function of essence. Perspective and essence were in his understanding virtually synonymous. 2005 to 2006 — Ken Wilber and Marc Gafni entered into dialogue about the nature of enlightenment. When Marc sent his doctoral dissertation to Ken, Wilber evolved some of the implicit structures in his position, and in a series of conversations and emails, recognized the Unique Self teaching that Marc was articulating as a significant new enlightenment lineage that has much to offer Integral Spirituality. Ken in his early reading of Soul Prints understood it to be a spiritual expression of the separate self. This was an accurate reading of one strain of unique self teaching. However, in reading Gafni’s academic work on Unique Self and Non Dual Humanism, evolved that teaching significantly. Wilber agreed with Gafni that Unique Self was a crucial evolution of the classical enlightenment teachings. Gafni also evolved some of the implicit structrues I his position as a result of the dialogues, formulating the core understanding of Soul Print/Unique Self more clearly as a perspective. Ken’s postmodern emphasis on perspective naturally dovetailed with the ontological kabbalistic emphasis of perspective, and together further deepened the Unique Self teaching. Dr. Gafni’s teaching may be seen as emergent from Hebrew mystical sources on the ontology of perspectives and from his own realization. Gafni clarified that it is a perspective attained at the post-egoic enlightenment level of consciousness, and he identified perspective as an expression of essence. January 2006 — Ken Wilber convened a gathering of some fifty leading spiritual teachers for a series of translineage meetings at the Integral Spiritual Center (ISC). 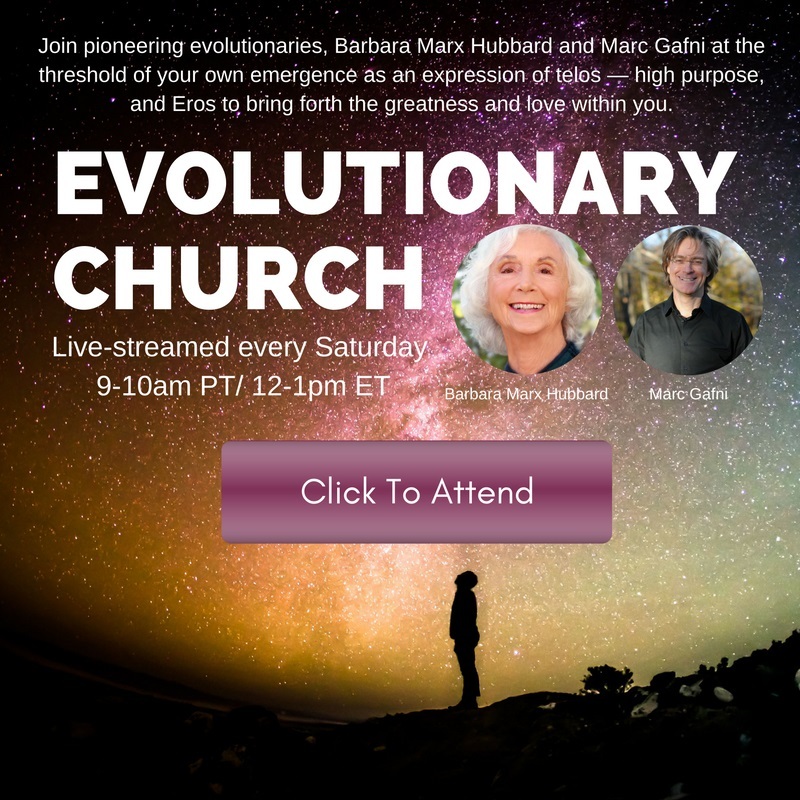 In a call with Marc before the meeting, Ken suggested prioritizing Marc’s term “Unique Self” over “soul prints” in his presentation so that the Unique Self teaching would not be confused with the separate-self/soul teaching of exoteric Western religion. Marc and Ken felt it important to move, in the Integral world, from the term “soul prints” and its third-person, metaphysical implications, to the term “Unique Self,” which more readily expressed the first-personal realization in post-metaphysical terms. This was key in allowing Unique Self to be integrated into Integral Theory. 2006 — Ken Wilber invited Marc Gafni to give a featured address to the spiritual teachers attending the ISC gathering on the nature of Unique Self enlightenment. This was a key moment in Unique Self’s emergence in the broader spiritual community. Many teachers wrote letters afterward saying that the Unique Self teaching significantly evolved their own understanding and experience of enlightened consciousness. Marc and Ken in their dialogues significantly sharpened the distinction between egoic individuality and post-egoic individuality. In the months after ISC, a number of teachers who were moved by the Unique Self realization began to incorporate it into their teaching, including Genpo Roshi, Sofia Diaz, John Forman, Diane Musho Hamilton, Sally Kempton, John Kesler, Vidyuddeva, and others. 2006 — Genpo Roshi and Diane Hamilton were also pivotal in the full transition in the Integral world from the term “Soul Prints” to the term “Unique Self.” At some point after ISC, Diane Musho Hamilton and Genpo began to use the Unique Self voice when they were teaching the Big Mind Process. 2006 — Andrew Cohen and Marc Gafni shared a public teaching in Tel Aviv in 2006. At this point, Andrew rejected Uniqueness, saying “there is no such thing as a Unique Spiritual Experience,” and Marc’s took issue with Andrew in an important exchange in their recorded debate. Through subsequent email correspondence and conversation, Cohen and Gafni gained greater clarity on the similarities and differences of their respective enlightenment teachings. Later, in 2010, Andrew and Marc would sit for a formal dialogue on the distinctions between Unique Self and Authentic Self, as part of the Future of Love series hosted by iEvolve and Integral Life. 2007 — Dennis Genpo Merzel, creator of the Big Mind process, which combined Western psychology and Zen, sees the publication of Big Mind Big Heart (Big Mind Publishing), a book which incorporated the Unique Self teaching into its framework. Genpo in a gracious written note explicitly thanked Marc for the Unique Self teaching, which he heard at ISC 2 and integrated into his Big Mind book and teaching. Marc thanked Genpo for the Big Mind voice dialogue process, which Marc incorporated into parts of his work. 2008 — Ken Wilber, Terry Patten, Adam Leonard, and Marco Morelli saw the publication of Integral Life Practice (Integral Books), which included a chapter entitled “Unique Self,” directly derived from the Unique Self presentation at ISC, which Terry (who authored the Unique Self Chapter) attended. 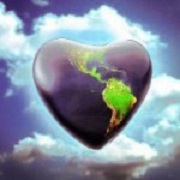 2008 — Marc Gafni, Diane Hamilton, and Sofia Diaz established an organization, iEvolve: Global Practice Community, which intended to create a worldwide community of practitioners of an evolutionary spirituality with Unique Self as one of the key teachings. 2009 — Marc wrote material which formed the basis for almost all of Your Unique Self (Integral Publishing). Dec. 2009/ Jan. 2010 — Unique Self further evolved the Integral space when Marc was privileged to initiate and lead an effort, together with Ken Wilber, Robb Smith, Diane Hamilton, and Sally Kempton, to reinvigorate the public practice space of the Integral Spiritual movement. The focal point of the effort was a series of annual Integral Spiritual Experience (ISE) programs/workshops. Because Unique Self had by that time begun to emerge as a new chapter in Integral Theory, the event’s inaugural gathering (ISE1) revolved around the teaching of Unique Self. In a series of dialogues with Lama Surya Das, Jean Houston, Alex Grey, and other luminaries, the teachings gained wider currency and acceptance. Marc wrote the core text for the Unique Self Teaching in the ISE material. The material was then edited and sharpened by Diane Hamilton. Jan. 2010 — In the keynote address at ISE1, Marc suggested that the emerging movement must transcend and include the Integral world as it had been narrowly defined. It was in this keynote that Marc coined the term World Spirituality and put forth the vision that the order of the day was to evolve and articulate a “World Spirituality based on Integral principles.” This keynote effectively began the latest recension of the World Spirituality movement. It unknowingly dovetailed with a theme of Ken Wilber’s throughout SES, the search for the guiding parameters of a true World Philosophy. Dec. 2010/Jan. 2011 — The second annual gathering of the Integral Spiritual Experience (ISE2) put the spotlight on Love, using centrally the “Three Stations of Love” teaching that Marc developed in connection to Unique Self. This model emerged for Marc from the teachings of the Baal Shem Tov which was naturally aligned with a key developmental model which is core to developmental studies. Creativity, the topic of the third ISE, was initiated jointly by Marc and Diane Hamilton. In a key dialogue while preparing for ISE 3, Marc and Ken clarified the role of Unique Self and creativity. 2011 — The Integral Spiritual Center evolved into Integral Life Spiritual Center organized by Marc, Ken, Diane Hamilton, and Sally Kempton. 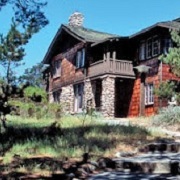 Integral Life Spiritual Center evolved the Center for World Spirituality (CWS) initiated by Marc together with Ken Wilber. Ken Wilber played a role — by formal agreement with Integral Life — as “a supporter and leading voice” in the Wisdom Council of Center for World Spirituality and a key initiating energy in the formation of the CWS. CWS emerged out of the iEvolve: Global Practice Community originally founded in 2008 by Marc, Diane Hamilton, and Sofia Diaz. Integral Life and CWS split, and in a written agreement, signed by Marc and David Riordan at Ken Wilber’s home, agreed to explore at a later date what the nature of their collaboration might or might not be. 2011 — Marc Gafni taught Unique Self to graduate students participating in programs related to Integral Studies at John F. Kennedy University. Hosted by the Chair of the Department, Sean Esbjorn Hargens, Marc delivered a keynote address at a JFK intensive which helped to solidify the importance of Unique Self teachings for the development as a critical new chapter in Integral Theory. 2011 — The Journal of Integral Theory and Practice (JITP), the official source for material related to Integral Theory and its application, devoted an entire issue to Unique Self. 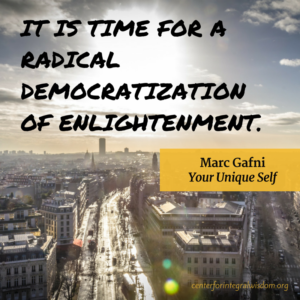 In this issue, Marc is the guest editor and writes two core articles on Unique Self, one emergent from Mordechai Lainer, and the other on the core Unique Self teaching, which are a cornerstone for World Spirituality teaching. Included in these articles is one by Zak Stein, which compares Gafni’s Unique Self teaching with Andrew Cohen’s Authentic Self teaching. 2011 — Marc gives a widely acclaimed TEDx talk on Unique Self at TEDx Las Vegas, which brings him into close collegial association with Eben Pagan and Wyatt Woodsmall, while introducing him also to Dave Logan. Eben and Wyatt join the board of Center for World Spirituality, and Dave joins the CWS Wisdom Council. Jan. 2012 — Chris Dierkes publishes an article on the Beam and Struts Ezine website, “Unique Self, Authentic Self, and The Flavor of Embodied Enlightenment,” fruitfully comparing Marc’s Unique Self teaching with Andrew Cohen’s Authentic Self teaching. Feb. 2012 — At the second annual Board Retreat of CWS, over two dozen attendees chartered an expanded and renewed vision for World Spirituality based on Integral principles and sharpened the role of the organization as a think tank committed to evolving the source code of human existence in our time. Unique Self is a lodestone in that core vision. May 2012 — A leading recovery/treatment center convenes a group of ten therapists to design a Unique Self treatment modality, to be implemented and formally measured and tested at the center. May 2012 — Integral Publishing takes the lead in launching the Unique Self Integral teaching in the world. May 2012 — A team is assembled to develop a Unique Self process which is to be launched online as part of a new Unique Self telecourse. There were two Unique Self courses offered prior to the new course and process, which were offered following Integral Spiritual Experience 1 in 2009-2010. May 2012 — Marc has initial conversations with Zak Stein, Lori Galperin, Laura Wood, Richard Barrett and others about developing a Unique Self Index. June 2012 — Integral Publishing published two academic volumes of nearly 1,000 pages called Radical Kabbalah. Part I: Unique Self and Non Dual Humanism and Part II: The Teachings of Mordechai Lainer of Izbica. Sept., 2012 — Integral Publishers brought out Your Unique Self: The Radical Path to Personal Enlightenment, the first book devoted to the Unique Self teaching. 2013 — Awakening Your Unique Self tele-course and practice community is offered for the first time to wonderful reviews by students. Wake Up, Grow Up, Show Up, and Participate in the Evolution of Love telecourse follows the course with great success. Course participants step forward to take more active roles in the CWS community. Fall/Winter 2013 — Marc publishes an ebook on Authentic/Unique Self, the two models of self in evolutionary mysticism. The book focuses on ten core differences between Marc and Andrew’s positions and why the differences matter so much.